…searched high and low to bring you silky cashmere from Inner Mongolia, which is also machine-washable (hooray). 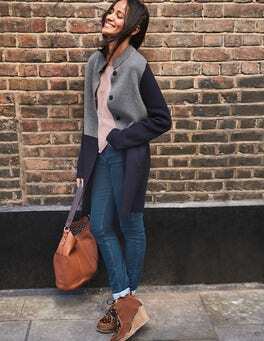 The yarns are skilfully knitted into this oh-SO soft cardigan, finished with stitch detail on the neck, cuffs and hem. Luxuriate in the softness, and feel ever-so pleased with yourself. We knew our crew-neck cardigan would get a lot of love, so we found a supersoft knitted blend with a hint of flattering stretch. Then we added internal contrast hems and hemline side splits – even the essentials should have something special about them, don’t you think? Need an emergency pop of colour? Just slip on this cardigan with its bold grosgrain detailing. Whether you're wearing jeans or a dress, the vibrant contrast tape adds a touch of fun while you ward off those evening chills. Edge-to-edge fastening keeps things smart and sophisticated.